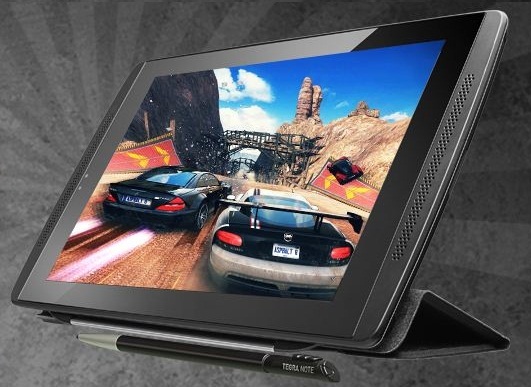 XOLO Play Tegra Note Tablet, Game on! XOLO, the larger venture of LAVA International with Intel has brought a new Tab in the market, which they claim to be the fastest of all the available ones. It is the new Tegra processor based-gaming oriented- “XOLO Play Tegra Note”. The device houses 1.8 GHz NVIDIA Tegra 4 mobile processor along side another Quad-core Cortex A15 CPU. The processors also get the rush from a 72-core GeForce GPU. On papers, it surely appears a revolution, but its real performance is yet to be tested in the coming days. XOLO Play Tegra Note is a 7 inch Tablet PC. It has got powerful speakers which rest peacefully, only until it’s playing music, behind the grills. The plastic cover doesn’t appear that premium, but is of decent built. A rubber finish would have been preferred as the Tablet will mostly see gaming, which is a touch easy when the grip is favorable. Since the touch is expected to be most responsive, the stylus is believed to remain very active. Because of this, the XOLO has taken great pains to pack along a good looking stylus. There is a mini-HDMI port which will enable the users to connect the Tab with a larger screen output. One can get a bluetooth console and sync it to the best and enjoy the PSP-like gaming experience. Let’s now deal with the usual specs of a Tab, with this Tab in particular. XOLO Play Tegra Note is an Android-bred Tablet PC. The cameras are 5MP and 0.3MP in the rear and the front respectively. The quality of camera will get much of your attention for all the good reasons. The speakers are placed in the front side and the output is delightful. This XOLO tab sports 1GB RAM, which won’t content a greedy gamer but will suffice for others. It has got sufficient 16GB internal space with an option for to include 64GB external space. XOLO Play Tegra Note Tablet has come at a time when ASUS along with Google has put their best foot forward in the Tablet PC market with their Nexus 7/7C 2013. Since XOLO is also turning a lot of heads with its performance quotient, Nexus might face a tough challenge spreading in front of the XOLO force.